I've missed showing you a lot of new fabric in my stash in the past few months, but here's some old stash fabric. In 2005 I participated in a purple charm fabric swap that resulted in The Purple Quilt that I finally finished last year. I have a TON of purple charm squares left, so when I was offered an opportunity to be part of a project-based blog hop, I added one more thing to the to do list and said yes! 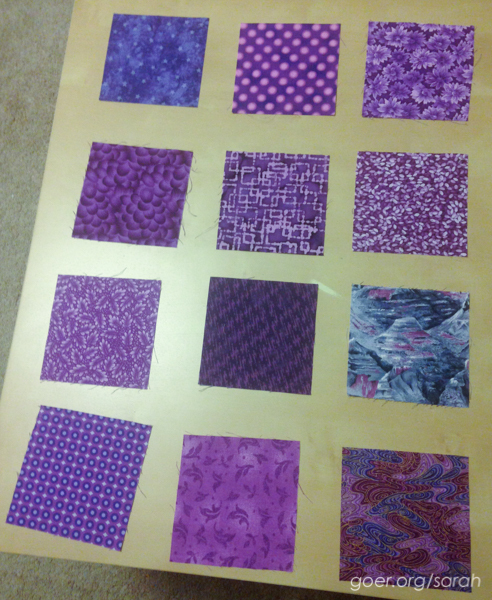 Now, since I already used my favorite fabrics on The Purple Quilt, I'm a little less than enthusiastic about the pile that I have left in my stash. So, step one was to sort through the pile and eliminate the ugly fabrics and the really ugly fabrics (no pictures of those). 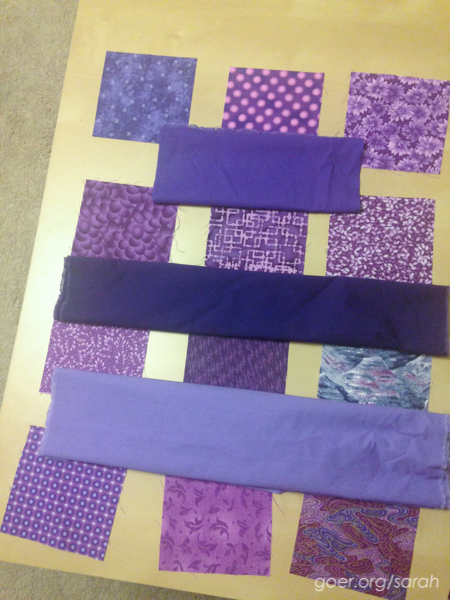 ;-) I ended up easily finding 48 purple charms in my stash and I'll only be buying some solid purple (dark indigo by American Made Brand, the middle one below) as my "neutral" to be able to get started on the blocks. This makes the fourth project that I cut fabric to start during the first week of January. At least amidst all that cutting I even also had my first finish of 2015 yesterday (my Disney Mini for the IG #DisneyMiniSwap2015 that I'll be mailing in the next day or so -- pics to follow). 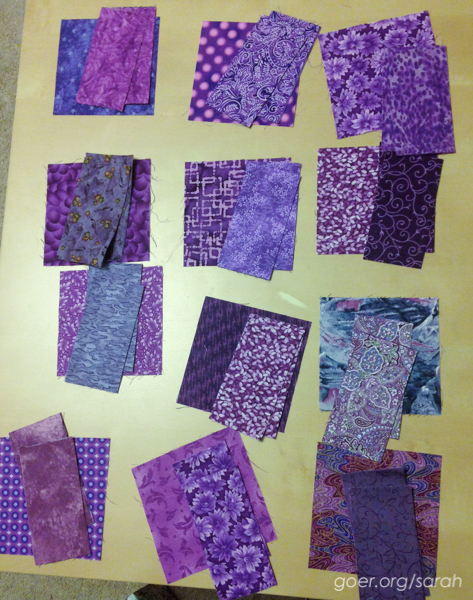 I'm excited to keep working on this purple project and for the blog hop reveal in March. Posted in Quilting. Tags: sewmystash2015, WIP on January 11, 2015 by sarah. I love purple! Looks like a fun project. Thanks, Jasmine. Purple is my favorite color. It'll be fun to work with. What is the fate of the very ugly fabrics!